Texas freshman Jordan Whittington was almost always the best football player on any field he stepped on. That was true whenever he played Yoakum in DeWitt County’s biggest rivalry game, and it was true when he rushed for 334 yards and scored six times in the 4A Division II state championship game against Pleasant Grove in December. He may not be the best football player in his program anymore, there’s a lot of talent on Tom Herman’s football teams these days. He probably isn’t the best player in his own position room. Despite those changes, Whittington is showing glimpses of why he was a nationally sought-after recruit before the first snap of his sophomore season. As a result of being a phenomenal athlete in a program located in a smaller town, lots of responsibility fell on Whittington’s shoulders. Not only was he the star wide receiver and wildcat quarterback, but also the star kick returner and the kind of safety opponents had to avoid. He committed to Texas over several regional and national schools after the Longhorns granted him the opportunity to play at his preferred position of wide receiver. A range of circumstances, some good and some bad for Texas, led to the coaches determining during his senior season that running back would be the best place for Whittington to start his career. His record-breaking state championship performance was a cherry on top to what Herman and the staff had seen from Whittington during his senior season, and it let them know they could try to get Whittington the ball via carries rather than receptions. “I saw him enough at wildcat QB his whole senior year to know that he was comfortable back there,” Herman said Wednesday. Whittington enrolled early, an advantageous start to someone learning the nuances of a position where previously he could get by on out-athleting inferior competition. Herman mentioned Whittington had to learn RB footwork, landmarks, timing, and other facets of the position Whittington had not fully explored prior to arriving in Austin. Jordan Whittington. The Future. See him take the field April 13, at DKR, for the Orange-White Spring Game. So far, he’s done everything asked of him early in his career. Herman praised Whittington’s comfort level on the field although his total number of practices can be counted on two hands. He also was complimentary of his work in film sessions and position meetings, something one of Whittington’s position mates noted as well. “He’s putting in the time and effort off the field as well,” Ingram said. Wide receivers often have a quick path to playing time early because so much of what receivers do is based off athleticism, where some 18 year-olds can match 22 year-olds. For running backs, that’s a different task. Not only do they have to grow accustomed to playing among fully-developed athletes in the trenches, they also have to learn to stop the progress of some of those full-developed men. Earlier in the spring, Herman was asked if they planned to work Whittington some at wide receiver. 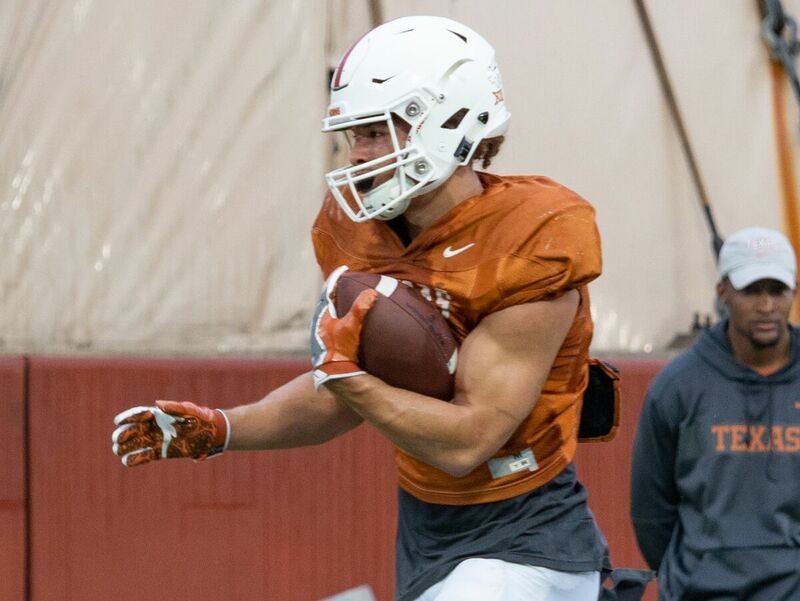 Herman said they might consider it during fall camp, but they prefer Whittington gets acclimated to running back before adding more to his plate. Whether running between the tackles or leaking out to catch passes, Whittington has caught Herman’s eye on multiple occasions. In an offense with lots of emphasis on hybrid roles and players, Whittington is in the early stages of carving out a role for 2019. It’s not solely the one he thought he would step into when he enrolled early, but it’s one he still is succeeding in, just like he has in every other stage of his career.